The developers have finally found a restaurant for the prime retail space at the corner of 7th and C Street, across from Eastern Market. BRGZ – burgers – will occupy the space in the mixed use retail/affordable residential North Building of the Hine Project. There’s not a lot of info about the new company – their FB page says they debuted as a pop-up in NYC at Oyster Bar: Pier A Harbor House (22 Battery Place) in February of 2018. They then touted, “The brgz team is launching their first pop up in NYC to offer the public a chance to try the first “truly custom burger”. More on this to come. Bad Restaurant Neighbors: In other news, gleaned from somewhat barren fields this past week, some bad neighbors have shown up on the list of restaurants seeking ANC6B support for liquor license renewals. District Soul Food is off to a rocky start on Barracks Row, with complaints about trash, noise, questionable disposal of grease, rowdy departing customers, and a complaint from next door Trattoria Alberto that cigar smoke is driving their customers away. 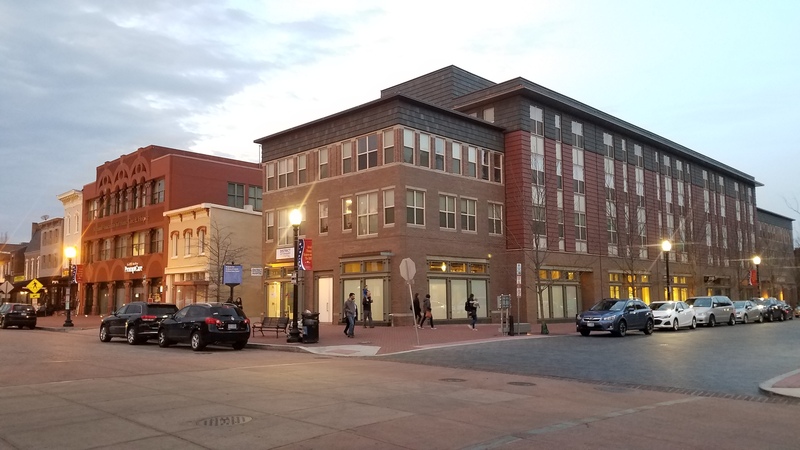 The Departments of Regulatory and Consumer Affairs are on the case, and one ANC6B Commissioner intends to protest the renewal unless issues are resolved before the next ANC meeting on April 9. Others in for a grilling on various issues by ANC commissioners: Bullfrog Bagels, Spike Mendelsohn’s Good Food, Little Pearl, Atish on the Hill, Buechert’s Saloon, and Sanphan Thai Cuisine. Those cases and others will be heard next Thursday in Hill Center by the ANC6B ABC Committee, chaired by Commissioner Chander Jayaraman. Metro Plaza Redesign: It turns out the Eastern Market Metro Plaza Community Meeting scheduled for April 3 at 7:00pm in Eastern Market’s North Hall is still on, despite the setback DGS designers received from the DC Fine Arts Commission who sent the design plan back to the drawing board. It’s not clear what the agenda will be, – it was supposed to be to presentation of the final design for the Metro “Park” to the community. Eastern Market/Flea Market: Over at Eastern Market, Manager Barry Margeson is rolling out a new voucher parking system to address concerns of South Hall merchants and outside vendors who complain the lack of parking on weekends is responsible for declining sales. The plan will provide a $4 discount parking voucher in the Hine Project while visiting Eastern Market. (Ask South Hall merchants for details) Merchants say that will help, but what they really want a similar arrangement for surface parking in the Colonial Parking Lot directly across 7th Street from the back of the market. Margeson said that discussions with Colonial Parking are on-going. In other news, Eastern Market and DGS will begin management of the outdoor vending spaces on the 300 block of 7th street on April 6 on Saturday – the Sunday flea market vending on the block will still be under the management of Michael Berman’s Diverse Markets. Shoppers will notice a change in the product line on Saturday, since the same criteria for vending on the sidewalk, north plaza, and 200 block of 7th Street outside of Eastern Market will now apply to vendors on lower 7th. The criteria limit vending to arts and crafts, antiques, and ethno- specific products (as opposed to just selling stuff). And, at last Wednesday’s EMCAC meeting, ANC6B Chair Chander Jayaraman pushed EMCAC for more budget transparency as well as for private management of the market (and Saturday vending on the 300 block of 7th Street) – which is required by law. He also said that EMCAC and ANC6B need to work together to take management of the Market “to the next level”, especially on the issues of leases for South Hall merchants and funding. EMCAC Chair Donna Scheeder said more information on the status of the RFP for the 300 block of 7th Street, leases, and a time line for the long-awaited strategic plan market study could be available shortly, since EMCAC had a meeting scheduled with DGS on these issues. The past couple of weeks had seen some contentious communications between Jayaraman and Scheeder over the de-privatization of the vending on the 300 block of 7th Street and this looked like détente. Another newcomer: Pesce Too, a popup restaurant open evenings upstairs at Bullfrog Bagels. It’s a branch of Pesce on P St NW in the Dupont Circle area. Ate there last night. An excellent addition to our neighborhood. Not quite sure what is wrong with “just selling stuff.” I mean, it’s a market, right? Market, from the Latin, deal, trade, buy. One person geegaw is another person’s treasure.